Want to get a better feel for the pulse of oil and gas drilling? 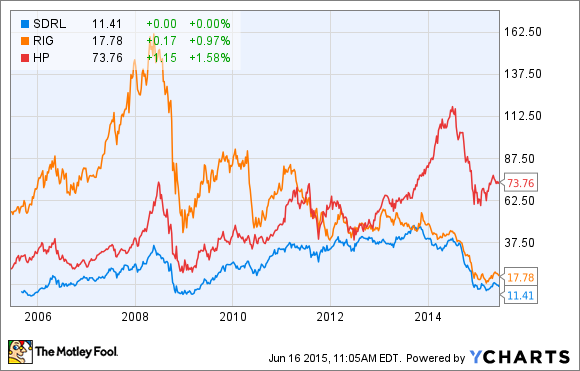 These three stocks should help you figure it out. The oil and gas industry is one of feast and famine. Companies that produce the stuff generally must plan years in advance to develop new sources, and the market when those sources come online might be wildly different than the one that existed when that project was conceived. For companies that specialize in oil and gas drilling, this situation can send stocks on wild oscillations. Here is a quick look at a few drillers' stock movements over the past 10 years, which translates to about two major industry cycles. These commodity cycles are crucial to the performance of the portfolios of those who invest in the space. To help you monitor the state of the oil and gas drilling industry, three companies -- Seadrill (NYSE:SDRL), Transocean (NYSE:RIG), and Helmerich & Payne (NYSE:HP) -- should be high on your "stocks to watch" list. Here's why each of them is worth your time to get to know. Seadrill: It's amazing what market timing can do for a company. A couple years ago, the thirst for oil was high and the prospects for drilling offshore looked mighty strong, particularly in places like Brazil where billions of barrels of oil were waiting to be tapped. Today, though, we are awash with oil thanks to shale drilling, several years of preplanned offshore projects coming online, and OPEC's refusal to lower production rates. We also face a sizable glut of offshore rigs. That excess supply of both oil and rigs is dragging down the dayrates that drilling companies like Seadrill can charge to production companies. That is a pretty precarious position for Seadrill to be in considering its high debt level and large swath of new rigs that are still under construction. However, Seadrill benefits from having one of the youngest fleets in the business, as companies looking to rent rigs will more likely go with newer ones. So Seadrill should at least keep a decent amount of rigs employed, if not at the most favorable rates. Also, with so many fresher rigs, the company is not subject to large numbers of rig retirements like so many of its peers. If you are looking at the long-term potential of offshore drilling -- and it does look promising if you peer out several years -- then Seadrill is likely a stock to watch. But you will probably need to be patient because it could take a while for things to tun around. Transocean: Pretty much everything I said about market dynamics related to Seadrill also applies to Transocean. After all, they are both major players in the offshore drilling space. The major difference is that Transocean has a fairly large fleet of older rigs. These rigs are becoming less and less economically viable as they age and as newer rigs hit the open water, and so will likely need to be retired. This painful process is under way: So far this year Transocean has announced the retirement of 19 older rigs. As these older rigs come off the books, the process should do two things: 1) It should reduce the costs associated with maintaining idled rigs that don't have contracts; 2) removing rigs from the market should help clear the glut and drive up demand for newer rigs, which in turn should increase dayrates. The speed at which Transocean retires rigs will play a large part in how long this industry downturn lasts. The faster Transocean and its peers pull the plug on older fleets, the faster the recovery. Helmerich & Payne: Transocean and Seadrill are bellwethers of the global oil and gas market largely because most offshore drilling involves what is known as the marginal cost barrels -- the cost to bring the last barrel of oil online to meet current demand. What we have seen over the past several years thanks to shale drilling and the restriction on exporting oil from the U.S., though, is that the domestic market and the international markets for oil don't necessarily behave in the same way. A company that is worth watching if you want a pulse of the U.S. market is Helmerich & Payne. Of the near 400 rigs owned by Helmerich & Payne, more than 88% are used in the U.S. land market; over the past several quarters those rigs have generated more than 80% of companywide revenue. According to the Helmerich & Payne's latest earnings report, just under half of the company's U.S. land-based rigs were under contract, which is largely pretty indicative of the overall trend in land rigs here. As prices for oil and gas climb and producers become a little less shy about drilling, Helmerich & Payne should do very well. This is because many of its idled rigs are capable of doing the tougher drilling jobs associated with hydraulic fracturing. Also, considering the company has remained profitable during this down cycle. it shouldn't have many issues weathering the storm until the industry picks up. Energy investing requires a certain temperament that can look beyond the undulating waves of the cyclical commodity market. When it comes to oil and gas drilling, it is particularly tough because companies in this space can get hit with the double-whammy of declining rig utilization and declining contract rates for rigs still in use. To keep track of what is happening in the market for oil and gas drilling, Seadrill, Transocean, and Helmerich & Payne are as good of indicators as any. Depending on your tolerance for short-term pain they might also be the companies to put on your personal investing radar.